We have some fabulous rates on our April late availability so why not treat yourself to a couple of days away. Your 5 star luxury boutique b&b room is waiting for you at Eighteen97. We currently have availability from Monday 22nd April, including some sneaky single night stays. Explore the beautiful North York Moors and coast this Easter. Why not indulge that special someone in your life to a ‘date night’ on Saturday 27th April when our gorgeous Vivaldi room, with its amazing moorland view is available for the night at just £115 when booked direct. And that includes our award winning breakfast too! Check out our late April availability and choose your escape here. Do you dream of running your own bed and breakfast? Lots of people do! Would you really like to know what it’s like? Then try our new Bed and Breakfast taster course! It’s a 2 hour workshop, usually taken as part of a stay at Eighteen97, although we can do this as a stand alone unit too, contact us for details of this. The workshop is fun, run informally, at your pace, allowing you to gain maximum insight into all aspects, from finance to fry-ups as we say! Our aim is for you to go away armed with enough knowledge to make an informed decision about your plans. We hope you will be inspired, excited, but most of all we want you to be confident in whatever decision you reach. After all the last thing you want to do is make any costly and lasting mistakes about your business and personal future. The lifecycle of a guest. All our workshops are face to face and individual, interactive and tailored to you. Giving lots of opportunity to ask questions and move at a pace you are happy with. We believe in doing these on an individual basis so you really do get the most out of the experience. If you are excited, would like to know more the take a look here or contact Fiona on 01947 896317. Don’t miss out on our Winter offers final availability! Our fabulous Winter breaks run until 31st March 2019. These give you £10 per night off a 2 night stay and an amazing £20 per night off stays of 3 nights or more! Relax in your ‘oh so comfy’ kingsize bed, laze by the open fire, feast on our fabulous award winning breakfasts. What’s not to like! Availability really is limited now and booking fast. There is just one Friday / Saturday weekend stay left, 22nd / 23rd March. Don’t miss it! Call us today to secure your 5 star stay at Eighteen97 in Goathland, Whitby, North York Moors or book direct online here. Everyone likes a great deal! So don’t miss our early booker offer! Book your 2019 stay before 31st January 2019 and get a great 5% discount! Simply enter code Early19 when booking direct online of call us on 01947 896 317. Valid on stays between 01/04/19 to 31/10/19. Minimum 2 night stay and cannot be used on conjunction with any other offer. 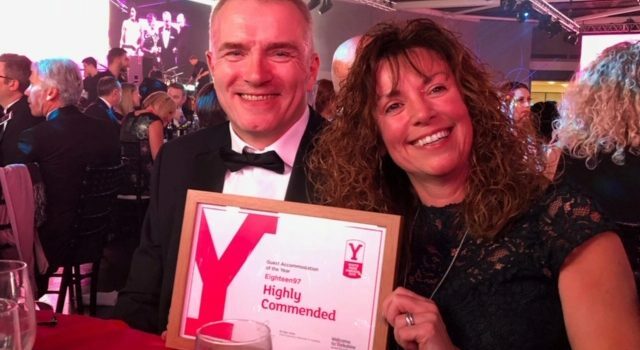 Highly commended at the 2018 Welcome to Yorkshire White Rose Awards Eighteen97 is your ultimate 5 star B&B to relax and revive in. Cill in your 5 star bedroom, feast on out award winning breakfast and embrace the splendour and beauty of the North York Moors and the historic coastline. Call us today on 01947 896 317 or book now online to secure your dates. ALL BOOK DIRECT FOR OUR VERY BEST RATES. We have just the thing! 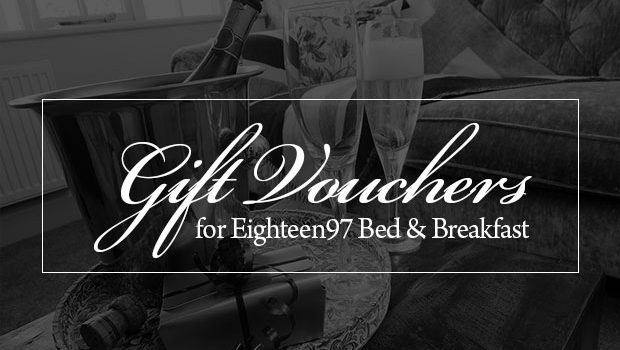 An Eighteen97 gift voucher. Valid for a whole 12 months and available in any amount from £50 upwards. And as an added bonus buy before 15th December and a bottle of Prosecco will be waiting in their room for the lucky recipient. Just quote FIZZ when you order your vouchers. Call us on 01947 896 317 to arrange your personalised gift voucher today! 2 nights from Friday 28th in Vivaldi from just £110 including our Winter discount! Book direct and we will apply our Winter discounts to the rates too! An optional pie and pea early evening supper is available on New Years Eve for those that partying the night away elsewhere!